Home»PLASTIC MINI DISHES»Tiny Utensils»Relections Mini Petite 4.2" Silver Fork 50pk. 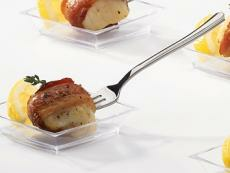 Relections Mini Petite 4.2" Silver Fork 50pk. Tired of using the same old mini spoons at your elegant events? Try our Reflections Petite Silver disposable plastic spoons. Your guests will go gaga when they see these spoons! These 4.2" petite spoons are perfect for appetizers, desserts, ice creams, and mousses. Be prepared to be complimented on your party planning genius - These spoons are miniature in size and price but huge in style! Clear Plastic Mini Presentation Spoon 12ct. Relections Mini Petite 4.2" Silver Spoons 50pk. 4.5" Clear Plastic Mini Tongs 10ct. Miniature Clear Plastic Disposable Asian Soup Spoons 10ct. Mini-Ware Clear Plastic Mousse Spoons 50ct.